It kinda snowed here today, well, more precisely, it was probably a soft hail that accumulated. About an inch, actually. I tried to take a picture outside my house, but couldn’t figure out the whole night-shot goodness on my camera. 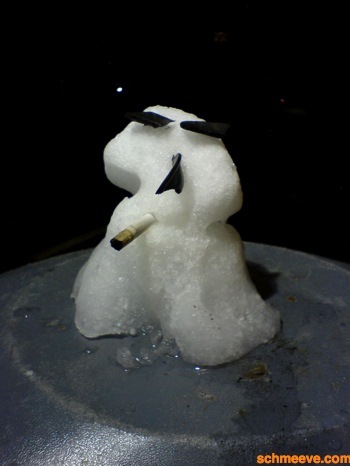 At any rate, a few hours later, I caught this pathetic smoking snowman still alive atop a trashcan @ Safeway.